Their out-of-control feeling and perhaps just a little too much ricketiness was hugely appealing to the American thrill-seekers for which the ride was initially invented. Unbanked turns span the circular ride cars at a pace that would today be more associated with the crazed waltzers seen at travelling fairs. The Virginia Reel was the brainchild of Henry Elmer Riehl, who named the ride after his daughter, Luna Virginia Riehl. It was in 1908 at Luna Park in New York City where the first model opened to the public. They were soon seen at amusement parks across the United States. The design also caught the attention of those across the Atlantic, particularly those that were already inspired by the American amusement park industry. Blackpool Pleasure Beach, under the direction of visionary Alderman William George Bean, imported a Virginia Reel shortly after the First World War. The park is famed for holding onto its vintage rides for as long as possible, but finally had to say goodbye to its Reel in 1982, after more than 60 years of operation. Blackpool’s model was the last full-scale Virginia Reel still operating anywhere in the world, as the ride fell victim to the rise of the steel rollercoaster. 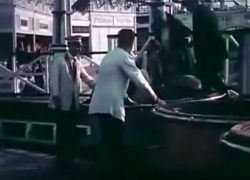 There is some brief but charming footage on YouTube which shows Blackpool’s Virginia Reel in the 1920s. The clip’s uploading is a welcome immortalised snapshot a ride type that the world has now lost forever. In a distant town on East Anglia’s coast, a final remnant of the Virginia Reel legacy lives on. The Tyrolean Tubtwist, found at Great Yarmouth’s historical Joyland amusement park, is a miniature, powered and much more moderate cousin of the classic ride. It is certainly worth the trip for nostalgia – or to almost witness history – but unfortunately, only those who experienced the original Virginia Reels will know what everyone else is missing. 3 Comments on "Virginia Reel: The rollercoaster that time forgot"
My introduction to the Virginia Reel was in 1952, at the Spanish City amusement park in Whitley Bay, Northumberland. It was wonderful — rough, fast and crazy! A few years later I discovered the Reel in Blackpool — rougher, faster and the cars could spin like mad! What a terrible shame that there are no Reels left. Great loss. It would probably be worth re-creating a new full size one — but the cost…. Thanks very much for sharing your memories Charles! I agree that a recreation would be fantastic!